Cream the butter and sugar in a large bowl using a spatula or an electric whisk until it is fluffy. Stir in the vanilla extract and thoroughly mix. In a separate bowl combine the flour, baking powder and zest. Add the flour to the creamed butter and mix until a soft dough is formed. Shape into balls spacing them well apart on a baking sheet, as they will spread in the oven. 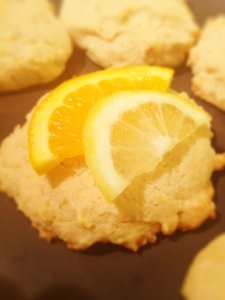 Use an orange and lemon wedge to "glaze" the top of each cookie.